"Masks" was crazy intense. Division was hit from both outside and inside forces that make a full recovery nearly impossible. The top leadership of the New Division has been decimated. It's easy to say they should have seen this coming or that they didn't take nearly enough precautions, but they were betrayed by two people in their inner circle. Alex and Owen were trusted leaders that betrayed their friends after Amanda's mind-altering procedures. In actuality, the crisis at Division is all Amanda's doing. She's used her powers for evil. Want some Nikita spoilers? Check out the video preview and sneak peek for the next episode, "Broken Home." Amanda uses her brain voodoo to visually show her childhood to Nikita. It looks like we'll find out how Amanda became ... Amanda. Amanda reveals why Alex is obsessed with making sure everyone at Division gets out safe. Ryan is still in a coma and Michael is captured. Nikita says she never wanted to kill anyone and then attacks Amanda. Though, Amanda has a trick on her fingers ... literally. 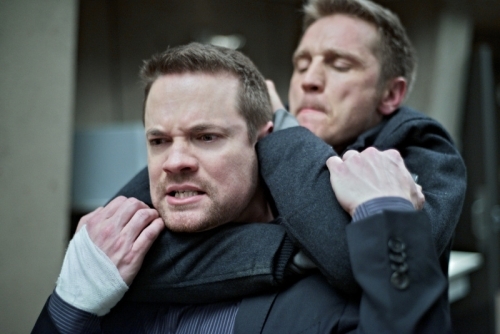 Nikita airs on Fridays at 8 pm ET on the CW.